Final MEDILIGHT press release is out! ISFOE is the biggest scientific & technology event in Flexible Organic & Printed Electronics (OEs). This year researchers, scientists, engineers, business managers, and policy makers from 59 countries participated to the event from 3 to 6 July in Thessaloniki, Greece. 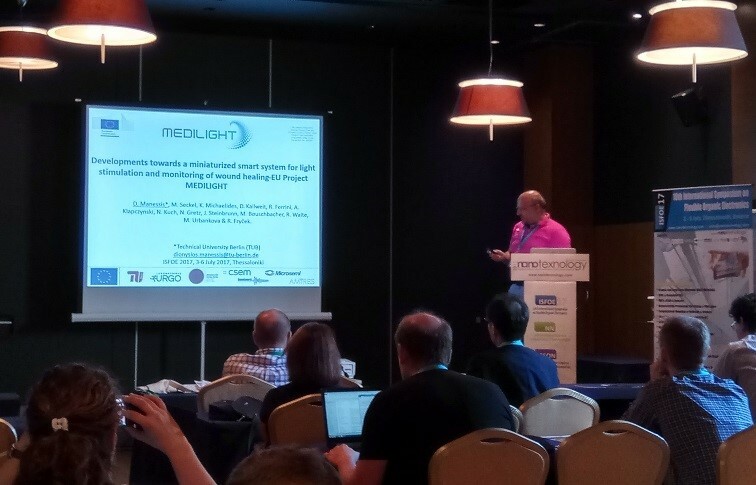 During a special workshop focused on Smart Textile and Wearables and presentation of potential applications and demonstrators, Dr. Dionysios Manessis, coordinator of the MEDILIGHT project, delivered a presentation titled Developments towards a miniaturized smart system for light stimulation and monitoring of wound healing – EU Project MEDILIGHT (click HERE for the presentation). 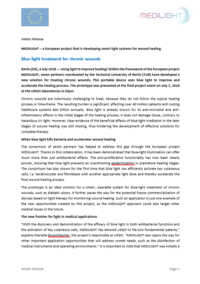 MEDILIGHT press release titled “MEDILIGHT Blue light for chronic wound healing”, which presents research results achieved so far in the biological part of the project, has been published by EU Publications Office on CORDIS, Community Research and Development Information Service (click HERE). 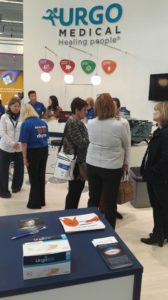 On 3 – 5 May, 2017, the 27th conference of European Wound Management Association, EWMA 2017, took place in Amsterdam, the Netherlands. The theme of the conference was: “CHANGE, OPPORTUNITIES AND CHALLENGES – WOUND MANAGEMENT IN CHANGING HEALTHCARE SYSTEMS”. 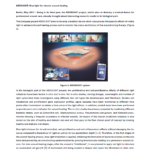 URGO RID, a partner of MEDILIGHT, presented at the event an e-poster titled “Developments towards a miniaturized smart system for light stimulation and monitoring of wound healing – EU project MEDILIGHT” (click HERE for the e-poster). Information about MEDILIGHT and the project’s brochure were also provided at the stand of URGO Medical. According to Julien Steinbrunn of URGO RID, ”MEDILIGHT attracted attention of the audience due to the innovative nature of this concept, based on the effects of blue light on both healing cells and bacteria, enabling a new personalized treatment for advanced wound care”. The MEDILIGHT project, an aim of which is to develop a smart medical device for wound care, has released its second press release. It provides information about the project’s research results in its biological part. Click HERE and enjoy the reading! An update of the MEDILIGHT factsheet has been released. This update reflects the change of the technical approach and modification in the type of light used. Click HERE and enjoy the reading! The MEDILIGHT was featured as a new pipeline product for would care management in the GlobalData Medical Intelligence Center Daily Alert published on 13 April 2017. GlobalData provides reports with data on a wide range of key metrics and indicators in the consumer goods, retail, technology and healthcare sectors along with valuable insight to enable more informed decision making. The information is available only to subscribed users (click HERE). MEDILIGHT project has released its brochure. Click HERE to find out about the MEDILIGHT project, its scope, chronic wounds, MEDILIGHT product and its application. The 10th Concertation & Consultation Workshop on Micro-Nano-Bio- Systems-MNBS 2016 took place in Otranto, Italy, from 27th to 28th June 2016. The workshop was held within the “ISOCS-MiNaB-ICT-MNBS” Joint Event on “Sensing for Smart Anything Everywhere: Materials, Technologies, Applications”. MEDILIGHT as one of the projects featured in the MNBS for in-vivo applications section was happy to present its research on the chronic wound healing using the light therapy (click HERE). The event report (click HERE) provides a comprehensive overview of the current state of MNBS technology and the market for its products. On 8 – 9 March, 2017, an international conference and exhibition on integration issues of miniaturized systems – MEMS, NEMS, ICs and electronic components, Smart Systems Integration (SSI) 2017, took place in Cork, Ireland. The event was part of the activities of EPoSS, the European Technology Platform on Smart Systems Integration. MEDILIGHT was represented at the event by Dr. David Kallweit of CSEM, who delivered a presentation titled “Smart System for Light Treatment of Chronic Wounds”. Click HERE for the event information and HERE to download the presentation. 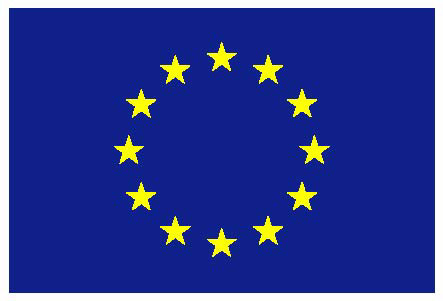 On Friday, 7 October, 2016, MEDILIGHT project month 18 (M18) review meeting with the European Commission took place in Dijon, France. The meeting was hosted by Laboratories Urgo, one of the project partners. During the event, technical progress of the project from month 10 until month 20 was presented. At the beginning of the meeting, Dr. Dionysios Manessis, the Project Coordinator, gave a presentation on the MEDILIGHT Project Overview, followed by more detailed presentations of the Work Package Leaders on developments in their respective areas. The reviewers also took a tour around Laboratories URGO’s production facility. The reviewers were pleased to see “nice and surprising results and nice progress” in the project as well as “very good interactions among the partners”. This project has received funding from the European Union’s Horizon 2020 research and innovation programme under grant agreement no. 644267, project MEDILIGHT. © 2015 MEDILIGHT. All Rights Reserved.